What Do The Xs Mean In A Cowboy Hat? What Do The Xs In A Cowboy Hat Mean? Most cowboy hats - both felt and straw - come with a label or tag describing the quality of the hat by using the letter "X" as a rating system. 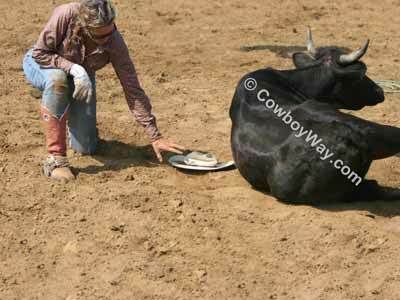 Typically, the more Xs a cowboy hat has the higher quality the hat is, at least according to the hat's maker. Below: A felt cowboy hat. Even though rating the quality of a felt or straw cowboy hat by using Xs is common, there isn't an industry wide standard for its use. This means that the "X" system is a relative rating of quality a manufacturer uses for their own line of hats, and their quality rating may or may not be comparable to another hat maker's. For example, if a hat maker rates a hat they make as a 3X it may, or may not, be of the same quality as a 3X hat made by someone else. Below: A smashed straw cowboy hat. According to the lady in the photo who is a friend of ours, the hat popped right back into shape. 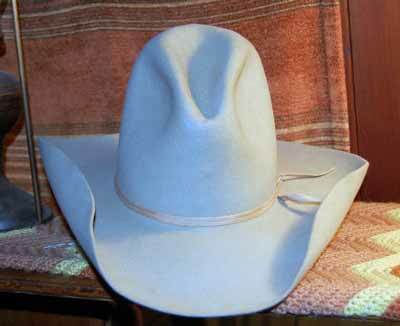 Not too many years ago the X rating system for cowboy hats applied to felt cowboy hats only. At that time the Xs indicated the amount of beaver felt content in a hat: The more Xs a hat had, the more beaver felt was used in its making. However, this old standard is no longer true. Today a great variety of cowboy hats are rated or described by using the X rating system, but they can be made of a variety of materials such as felt (regardless of whether or not it's beaver felt), straw, or others.